On our last weekend in Portugal, we decided to head south for a day trip to the Algarve, as the south coast is called. 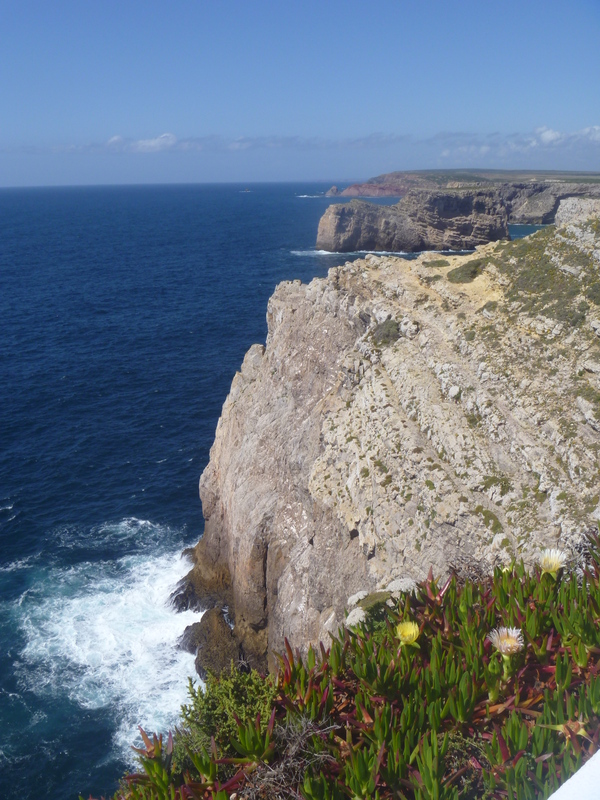 In particular, Jonathan wanted to see Cabo Sao Vicente, the southwesternmost point in mainland Europe. We planned to go on Saturday, but rain was forecast, so we opted for Sunday and hit the road by about 10 am, typical for us. The landscape shifted toward grassland, and we saw some flocks of grazing sheep and goats. Nearer the coast, the soil was sandy and scrub covered. Our first stop was in Portimao. Based on my previous shopping failures, I had looked up every weekend market in the Algarve for something interesting to visit. I found “lota cool market,” an annual design-oriented event put on by local artisans. After I double-checked that it was actually going to take place (recent google mentions, facebook page), I looked for an address. What I found was “the ribeira” (riverside) in Portimao. I looked on google maps and didn’t see an area with that name. 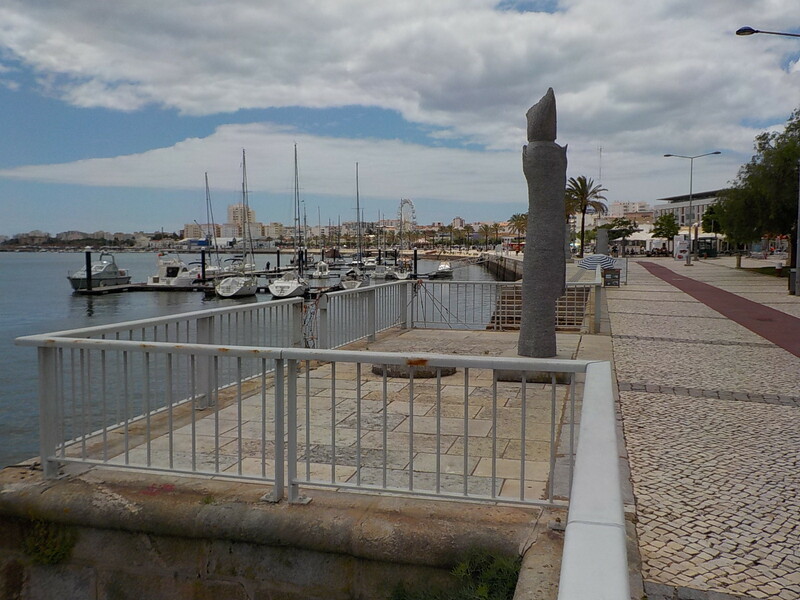 I checked further and kept finding the same information, then I found “near the velho porto” (old fishing port). Having never been to Portimao, I didn’t know what that meant and again, there wasn’t a label on a map that said “old port.” Finally, I followed a few facebook posts to, “if you’ve never been here before, we’re at the foot of the old bridge coming into town from Parchal.” None of the bridges were named on my map, but I found Parchal. The post included a photo of the old bridge, showing a blue, lattice structure below the bridge that finally let me identify the likely spot for the fair. With this homework, we arrived in Portimao and immediately lost sight of the water. My GPS reception was so poor that it didn’t even show the river. We headed toward the center of town to ask questions when I saw a sign, “Ribeira.” We got to the river and there in the distance was the old bridge with its distinctive blue structure. There was even parking. We strolled down to the event. It was small but interesting, with local food producers including a cake designer who had a Barbie-sized fondant figure on her demo cake (impressive). There was clothing, mostly for babies and children, toys, wood cutting boards, cork products including a bicycle and chairs with cork in place of upholstered seats and backs. Jewelry was made of coiled newspaper, laser-cut lucite and polymer clay. 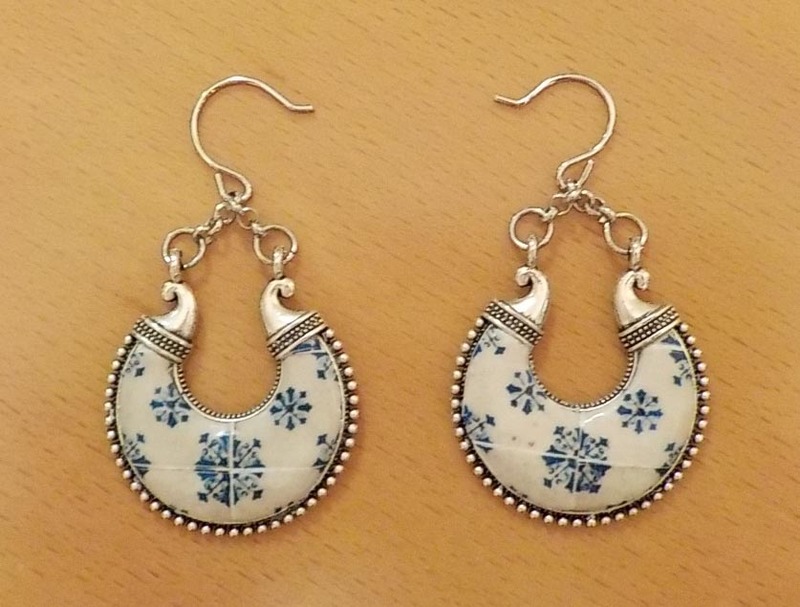 The earrings I bought have images of traditional Portuguese tile baked onto the clay. It’s a contemporary application of traditional tile designs that I haven’t seen elsewhere. These earrings are by “Love in Boxes.” See facebook for more. She participates in many summer markets in the Algarve including ‘lota cool’ market in Portimao, the Saturday market in Loule, and the ‘Mercado de Culturas….a Luz das Velas’ a candlelight market in Lagoa July 7-10, 2016. Leaving the market, I ate an “artisan” ice cream of chocolate with fig and almond. It was a good stop, but we weren’t to the end of Europe yet. Next was Sagres. There are two southwesternmost points in Europe, 6 km apart. Sagres is home to a huge fort in the process of being restored. There is a long walking trail along the cliffs, signage about flora, fauna, and the ocean, with great views. Part of the Sagres fort. Visitors have built many small cairns of rock. A small platform lets you look into a deep blowhole. Along the cliffs (40 ft, 60 ft.? ), a dozen or so men were fishing using long poles, big reels and a heavy weight. I was curious to know what they caught when one man reeled in a slender fish about 12 in long. It looked small compared to his equipment but he promptly killed it, gutted it and put it in a cooler. We also saw a black redstart on our walk back to the car and wished we’d brought binoculars, because there were a number of birds in the scrub. 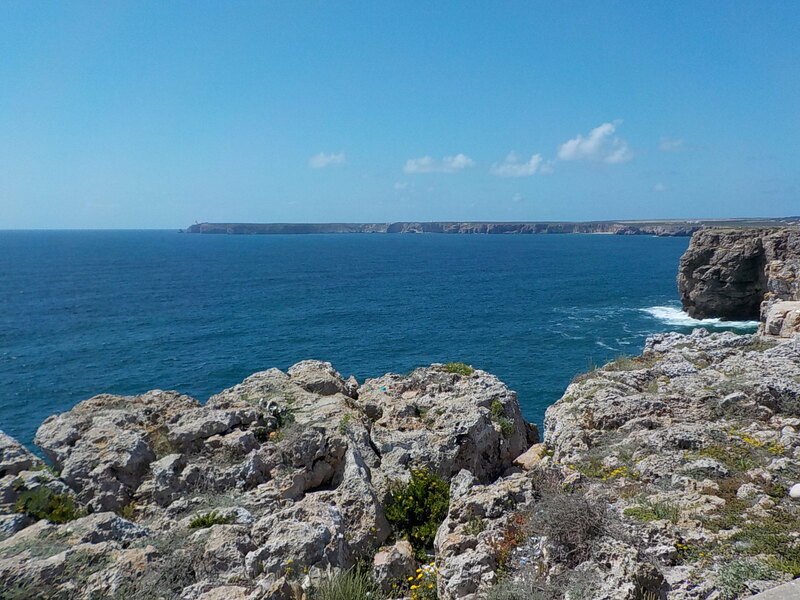 Cabo Sao Vicente from Sagres. Last but not least was the official furthest point out to the SW, Cabo Sao Vicente. 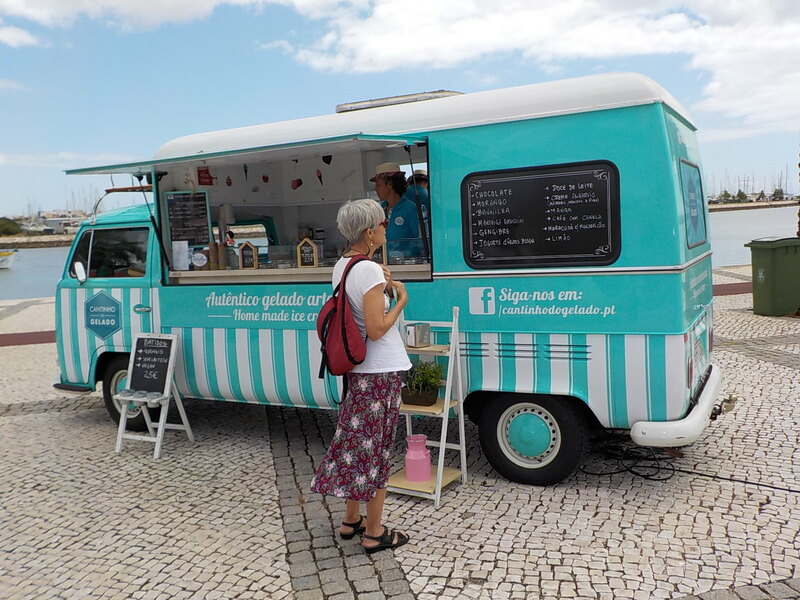 The site is not quite as developed as Sagres, but on a Sunday afternoon, there was a line of food trucks and souvenir vendors that covered a much larger area than the overlook of the ocean. Much of the actual point is blocked off by a lighthouse, though some of this may be due to construction. As a result, you can look out over the neighboring cliffs. For looking right out to sea, imagining what it was like when no one knew what was beyond the horizon…….for that you visit Sagres. We picnicked along our route, and stopped for coffee on the long drive home. We got back before 8 pm. With only a couple of days left in Portugal, all our meals are leftovers, so it was quick to set the outdoor table, pour a bit of vinho verde and watch the sunset over a late dinner.